The 21st century’s just about sure to see the end of what, in terms of human evolution, has been aptly dubbed “The Fossil Fuel Era.” The transition to cleaner, renewable forms of energy and power — be it for lighting, heating, cooling or industry — is (pardon the pun) gaining steam. And while gains are slower and more difficult to come by, the same can be said when it comes to transportation, that other major component of fossil fuel consumption and greenhouse gas emissions. A growing number of entrepreneurial companies — from multinational giants such as GE to small-scale newcomers, such as Tesla, A123, and a bevy of others — are hard at work developing electric, flex and hybrid fuel vehicles, as well as the infrastructure to support them. Electric vehicle (EV) sales jumped 164% year-over-year in June. Sales of the Lexus CT200h increased 500%, while Chevy Volt sales surged 200% higher, according to the Kelley Blue Book Market Report. There’s good reason to believe that this surge in the search and development of clean, alternative fuel vehicles and infrastructure will be different; that a drop in oil, gasoline and diesel prices won’t be enough to derail progess, as happened in the eighties and nineties subsequent to the oil crises of the 1970s. Two news items this past week provide supporting evidence. GE’s industrial division and Urban Green Energy (UGE) came out with word that the first installation of their Sanya Skypump is up and running at the headquarters of environmental services company Cespa near Barcelona, Spain. Integrating New York–based Urban Green Energy’s 4-kW vertical-axis wind turbines (VAWTs) and GE’s DuraStation EV chargers, the Sanya Skypump points the way toward fueling stations of the future that gather all the energy they need from the wind. Along a similar vein, San Diego’s Envision Solar announced it has successfully completed engineering and manufacturing of its first run of pre-cast concrete columns for its Solar Tree arrays. Parking lots are ideal sites for Envision’s Solar Trees. Combine them with EV chargers and you have a clean, renewable fueling station right where EV motorists need and want it. The Sanya Skypump can fully charge EVs in 4-8 hours, using electricity produced by UGE’s 4-kW VAWT, which stands 42 feet high, according to the partner companies. Winds of at least 7 mph are needed to generate electricity. Plans are in the works to install Sanya Skypump EV fueling stations in the US and Australia before year-end, GE and UGE say. Sites include shopping malls and universities, as well as other locations. A big advantage of the Sanya Skypump wind-powered EV fueling station is its installation time. The entire system takes less than two hours to get up and running, the companies say. Envision Solar’s new pre-cast Solar Tree concrete columns are part of its “Drag & Drop Infrastructure” product line, one that “offers much faster, more efficient deployment of Solar Tree structures,” the company explains. “We are continually leveraging technology to increase our efficiency and quality. We call this new modularized approach: Drag & Drop Infrastructure™ — creating the shortest possible time and ease for deploying the best solar shaded parking products in the industry with the least disruption in the field,” Envision Solar president and CEO Desmond Wheatley elaborated. Manufacturing the concrete columns in a controlled environment enables Envision to produce the highest quality results. It also makes for much more efficient installations. The new Solar Tree columns enable Envision to install the solar PV structures in hours rather than the days or even weeks required for columns that are cast in place, director of Program Management Peter Seiler added. Full Circle Apple’s future will not fall far from the tree. On the very same day in March, Texas announced a huge new Apple Inc. campus in Austin (notably without a quote from Apple), and Apple submitted revised plans for a new headquarters campus in its hometown of Cupertino, Calif., that would boast a Texas-sized capacity of 13,000 employees. According to the results of the latest “Best and Worst States for Business” survey by Chief Executive magazine, released in May, Texas is first in the nation. California is last. But both sites are aiming to be built to last for Apple, as it looks toward new horizons even as the sun sets on the life of its late founder and technology icon Steve Jobs. The $304-million Austin project aims to create 3,635 new jobs by 2025 at a new campus in North Austin, which appeared to have beat out Phoenix for the project. The state has offered Apple an incentive of $21 million over 10 years through the Texas Enterprise Fund (TEF), and other local incentives are on offer. However, as of June government officials were still awaiting final confirmation from Apple. In California, the plan updates have continued to flow this spring from Apple to state environmental authorities and to the Cupertino City Council, whose chambers hosted Jobs in one of his last public appearances last summer. “Apple’s growing like a weed,” he said then, explaining that his company’s core buildings now hold 2,800, but that an area work force of 12,000 had required “renting buildings — and not very good buildings either — at an ever greater radius from our campus.” The latest outgrowth for the company occurred in March 2012, when the nearby City of Sunnyvale announced that by the third quarter of this year, Apple would move approximately 400 employees into the entire 156,000-sq.-ft. (14,492-sq.-m.) second office building at the Sunnyvale Town Center redevelopment project, next door to a 500-person Nokia operation. So, in addition to its existing campus in Cupertino, the company is planning to build Apple Campus 2, “an integrated, unified, and secure state-of-the-art office and research campus designed to serve as a model workplace for the 21st century.” Foster + Partners are the architects for the new campus. The general contractor will be a joint venture of DPR Construction and Skanska USA Building Inc.
Apple Campus 2’s focal point is a 2.8-million-sq.-ft. (260,120-sq.-m.) ring-shaped main office building, which will consolidate 12,000 Apple employees together into one integrated workspace around an expansive courtyard. A company spokesperson declined an interview request regarding the California and Texas projects. But thanks to transparent application requirements in California and Apple’s own increasingly thorough transparency efforts, some meaningful details can be gleaned from documents alone. > “The Project will replace and rebuild 2.66 million sq. ft. [241,540 sq. m.] of existing aging office buildings and surface parking lots on a 176-acre [71-hectare] infill site with 3.3 million sq. ft. [36,570 sq. m.] of high-performance energy- and water-efficient buildings, below-grade and structured parking, and more than 115 acres [46 hectares] of landscaped green space, nearly three times as much as before.” It’s aiming for LEED-Silver certification. > In addition to the Project’s signature ring building, additional structures include ancillary research buildings (another 300,000 sq. ft. [27,870 sq. m.] for another 1,000 employees), a central plant, a 1,000-seat corporate auditorium, a corporate fitness center, and above- and below-grade parking. “These buildings will be integrated into the site’s newly created and expanded green space, which will be landscaped with native vegetation and approximately 6,000 trees, including orchard trees reflecting the region’s agricultural past” as an apricot orchard. > “The Project will be entirely powered by renewable energy, which will primarily be generated on-site from fuel cells and more than 650,000 sq. ft. (60,385 sq. m.) of solar panels installed on building roofs, making the Project one of the largest corporate campus solar installations in the world.” The project is likely to deploy fuel cells made by Sunnyvale-based Bloom Energy Servers, whose units are already destined for Apple’s mega-data center in North Carolina. A recent New York Times piece on Apple’s tax planning explored the company’s Braeburn Capital subsidiary, conveniently based in Reno, Nev., where the state levies no corporate income tax and where Apple processes its profits. The article also called into question whether Apple was paying its fair share in California. But the company is still Cupertino’s largest taxpayer, paying some $8 million in local property taxes. 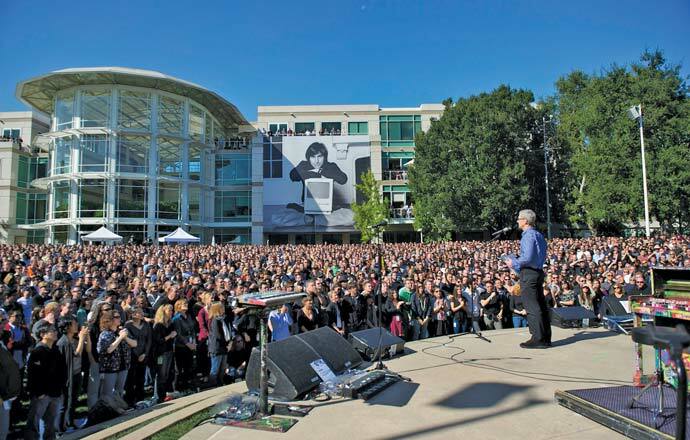 Apple CEO Tim Cook speaks at a celebration of Steve Jobs’ life on Oct. 19, 2011, held at Apple’s current HQ. > On-site services that reduce the need for midday errands. The campus is ahead of its time in more ways than one. Senate Bill 375 requires that each metropolitan planning organization in the state prepare a Sustainable Communities Strategy (SCS) as part of a regional transportation plan (RTP). However, the Bay Area’s SCS will not come into effect until 2013. The greenhouse gas (GHG) reduction target for the SCS requires a reduction of per-capita CO2 emissions from cars and light-duty trucks by 7 percent by 2020 and by 15 percent by 2035 (compared to a 2005 baseline). “Not only is the Project consistent with these targets, it will serve as a model for how the Bay Area can achieve them,” says Apple, citing its non-drive-alone commute rate of 30 percent or more and its provision for the 300 EV charging stations. Apple estimates that construction alone will generate 22,967 person years of employment, which will translate into 9,187 full-time construction jobs over a 30- to 36-month construction period. According to a supporting document filed by the DPR/Skanska JV, median hourly union wages associated with some of the job classifications most prevalent on the project site include $44.18 for a construction laborer, $78.48 for an electrician and $81.14 for a sheet metal worker. Cupertino’s median household income from 2006 to 2010 was $120,201, nearly twice the figure for the state as a whole. Even as the state application makes its way forward, the company is seeking more than a dozen approvals and entitlements from the city, including right-of-way transfers, zoning amendments, and utility relocation and easement agreements. Apple anticipates commencing construction immediately after approval and expects construction to be completed by the fall of 2015. And for those already wondering, there is a Phase 2: “Phase 2 includes programmatic approval of an additional 300,000 sq. ft. [27,870 sq. m.] of development capacity for up to 1,200 employees that could occur anywhere on the Apple Campus 2 property, providing limited flexibility to address future operational or business needs,” says Apple. The land Apple acquired has distinct ties to the teenage invention needs of founder Steve Jobs, as he related in his speech to the city council last summer. At the same time, HP bought property in Cupertino for their new computer systems building — the same property that Apple just bought from HP as the latter company has been shrinking its footprint. Apple’s aim is to enlarge its footprint at the same time it shrinks the carbon footprint of the site. Even with a 20-percent increase in building space, the company aims to go from roughly an 80/20 split between building/pavement and landscaping to its exact opposite. HIGH FALLS, N.Y. — The gas station in this Hudson Valley hamlet sat empty for years, leaching petroleum into the soil and well water. But a renovation that will transform the abandoned station into a yoga studio, wellness center and a charging station for electric cars has turned the eyesore into a symbol of this struggling community’s revival. The station’s decline mirrors that of many others across the country. Thousands of gas stations have closed in the last two decades, leaving many communities saddled with vacant or abandoned properties. Because gas stations are often built on busy street corners, boarded-up stations have marred the entrances to many bustling business districts in American towns and cities. More than 50,000 stations have closed since 1991 when there were nearly 200,000 nationwide, according to the National Association of Convenience Stores. The high cost of oil has made it hard to turn a profit selling gas, pushing station owners into selling snacks and soda at their convenience stores. With big-box retailers like Walmart and Costco now in the gas business, attracting customers has become even harder. Simply put, mom and pop stations that once thrived just by selling gas and fixing cars in the repair shop can no longer compete. No numbers are available on how many closed stations remain vacant, but despite problems, the properties can be attractive to developers, especially if they are at desirable intersections. But converting these sites can be challenging. They often are on small lots and may be contaminated by petroleum leaking from underground storage tanks, as was the case in High Falls. Petroleum brownfields — ground contaminated or thought to be contaminated by fuel — make up half of the 450,000 brownfields in the country, according to the Environmental Protection Agency. As gas stations close, towns must grapple with what to do with this land. If fuel has migrated into groundwater or a neighboring lot, costs can balloon. State and federal money available to municipalities to clean abandoned sites is limited. Federal regulations require private owners and operators to clean any spills on their property. Still, some developers are reluctant to buy old stations because of the risk that contamination could be found later and they would be stuck with the cleanup bill. In High Falls, a $300,000 renovation is changing a derelict structure to a colonial-style strip of yellow storefronts with white trim that will be completed this summer. Then, charging pumps for electric cars will be installed where two gas pumps once stood. The quick-charge pumps will offer free charging to store customers and anyone else. A wind turbine affixed to a 30-foot ledge behind the station and solar panels atop the ledge will generate the electricity. In a village that once was home to Marc Chagall and the setting for some scenes in “Splendor in the Grass” a former neighborhood blight has become a new downtown center. “It’s so nice. It’s part of the revitalization of High Falls,” said Michael Warren, town supervisor for Marbletown, which encompasses the hamlet. But it is not always easy to persuade developers to invest in a property that may need costly environmental cleanup. The High Falls station cost the New York State Department of Environmental Conservation more than $100,000 to clean up in 2001, seven years before Mr. Robinson bought it. “Whenever you see a for sale sign, it never says ‘brownfields for sale,’ ” Mr. Colangelo said. While rural communities struggle to fill empty stations, New York City has a different problem. Property values are so high that stations are being converted to more profitable uses, like high-rise buildings, giving drivers fewer places to fill their tanks. The city had 809 gas stations in 2011, down from 872 in 2006, according to the Department of Consumer Affairs. Of the remaining gas stations, only 44 are in Manhattan. 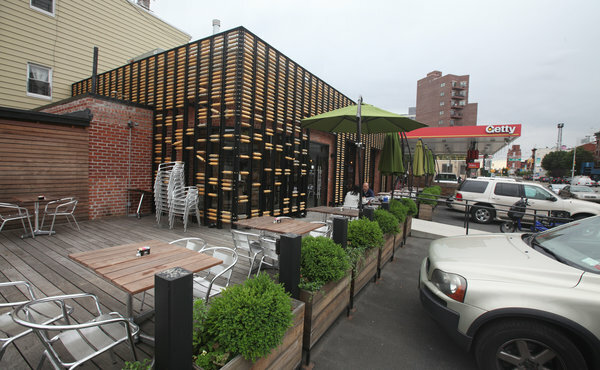 In 2009, Eyal Shuster, a developer, spent $1 million to convert a defunct Long Island City service station into the Breadbox Cafe, which his wife, Tal, manages. A Getty gas station next door, however, is still operating. Mr. Shuster and his development partner, Moshe Mizrahi, hope to eventually build a high-rise building above the restaurant and demolish the Getty gas station. On a rainy afternoon in June, the 48-seat restaurant was full of customers. From the street, the boxy single-story building still resembles a service station, despite the quirky addition of 1,600 rolling pins on the facade. New garage doors with large glass panes roll back, opening out onto a wooden patio. Inside, zinc countertops and mahogany paneling give the space a modern look. While gas stations might be an eyesore in some communities, in others they are treasured slices of Americana. A St. Louis developer met fierce resistance when he considered demolishing a 1968 Phillips 66 station. The building has an enormous flying saucer-shaped roof. Although it has not been a gas station since the 1980s — its latest incarnation was as a Del Taco restaurant that closed in 2011 — residents saw the building as a piece of the city’s architectural history. Rather than build anew, the developer Richard K. Yackey will begin a $1 million renovation this month on the property, which has 3,200 square feet of usable space. The roof, which is 12,000 square feet, will cost $100,000 to replace. When construction is complete next year, the station will house a Chipotle restaurant and a Starbucks and have a 1,300 square feet addition. “If you do the math, it doesn’t make a lot of sense economically,” Mr. Yackey said, adding that constructing a building on the property would have provided him with more space to lease. Because many old gas stations sit on small, three-quarter-acre lots, they often have to be expanded to be marketable. Buyers of old stations often angle to get the neighboring lot. But that, too, can be fraught with complications. “Any time you’re putting multiple parcels together it becomes more difficult because you’re dealing with another seller,” said Joseph S. Botta, president of Pineville Properties, which has redeveloped several gas stations in the Philadelphia area. In Roxborough, a section of northwest Philadelphia, developers drew the ire of local residents when they knocked down two houses next to a former Mobil gas station to make way for a TD Bank that opened last November. “Neighbors get very concerned when you’re knocking down residential houses for commercial uses,” said Michael J. Cooley, vice president of real estate for the Provco Group, which built the bank. But developers who cannot expand can be left with a property they cannot use. Mr. Botta said he bought eight gas stations from Lehigh Gas Corporation for $11.5 million in 2008. By June 2011, unable to expand the lots, he sold four back to Lehigh.